Dialogue means Debates and everyone’s point of view. Healthy debates play a major role in overall personality development of children. 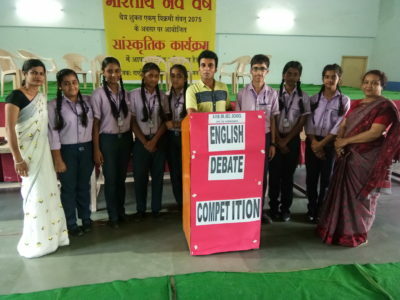 Students of Grade IX – XII participated in an Inter House Debate Competition held on 9 August 2018. The topic of discussion was ‘Should Celebrities be considered as Role Models?’ Each house was represented by 2 participants. The speeches turned to healthy discussions, then fiery arguments and counter arguments. Each quote and counter attack was greeted and feted with round of applauses by the audience. The judges found it difficult to adjudge the winner as the competition was neck to neck.